You can also configure any of the function keys F1-F12 or a combination of Shift + a function key. With any of the above buttons or icons, you can configure them to print to a specific printer, open the HardCopy program, save the screenshot automatically to a specific directory, prompt with a Save As…, and/or many other possibilities. To open HardCopy, go to the Start Menu -> Programs -> Hardcopy – Print Screen -> Hardcopy. 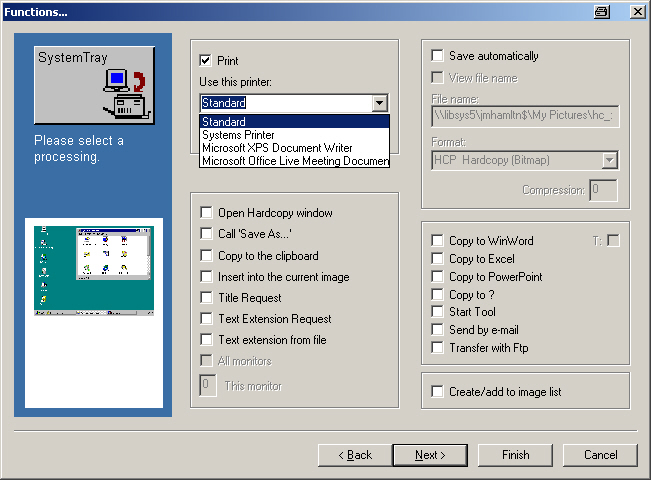 Alternatively, you can right-click on the HardCopy system tray and choose Show Window to open HardCopy. This will open a new window that provides your choice of what you’d like to configure. Just click on the button of what you’d like to configure. Once you click on the button or icon to configure we’ll move onto page 2. This will allow you to specify what you want this button to capture: the entire screen, the current active window, a rectangle of your choosing, and a few other options. Select the radio button corresponding to what you’d like to configure and click Next. The next page offers further options to choose what you want automatically done with the screenshot. You can choose to have it print automatically, save the file to a directory, prompt for a Save As… dialog, open the Hardcopy window, or more. Further options allow you to specify which printer it prints to, or if it should open in a specific application. After selecting the check boxes and/or choosing from the drop-down the behavior you want, click the Next button. 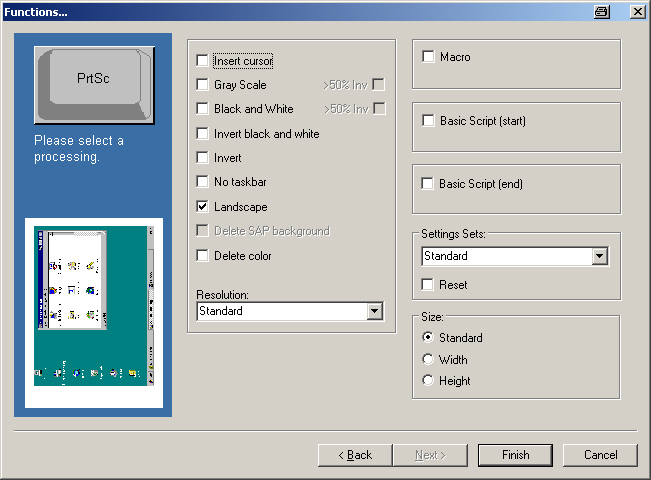 On the last page of the configuration you can select the finer details for the print screen behavior: Landscape vs. portrait printing, black and white vs. color or grayscale, and macros or basic scripts. The page on the left hand side gives a little preview of how the image might look. Click Finish when you’re done. An ideal setup might consist of having one button to take a screenshot and open the Hardcopy window (so you can verify what you’re saving or printing), another button to print the image directly (when you don’t have doubts), and another pair of buttons to do the same thing for the active window instead of the screen. If you were making a tutorial, you might configure a button to take a screenshot of the active window and save it to a specific folder for this project you’re working on. You can also configure Hardcopy so that it does not have the title bar icon. With the Hardcopy window open, go to Settings, Quick Settings -> Printer Icon left Key -> No function. Do the same for the Printer Icon Middle Key and Printer Icon right Key.